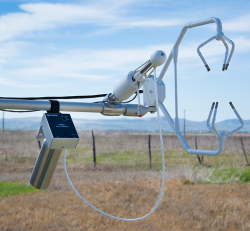 The last few months have been filled with excitement as new solutions from Campbell Scientific’s micrometeorology product line have been made available. 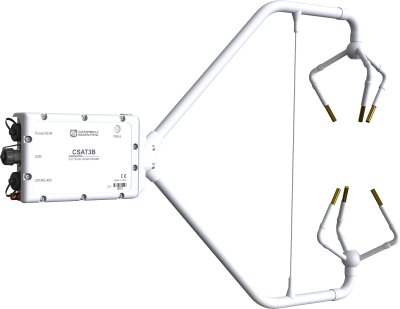 Following the release of the TGA200A Trace-Gas Analyzer, highlighted in our last newsletter, the CSAT3B 3D Sonic Anemometer quickly followed. 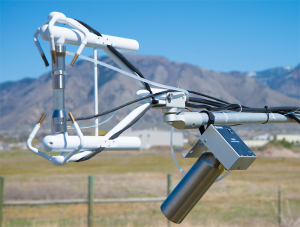 Improvement to the communication options is particularly beneficial for users interested in sonic-anemometer networks. 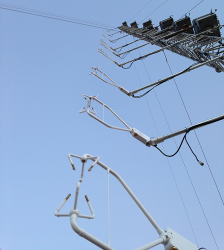 For example, the photos below show a site in China where the new CPI (CAN peripheral interface) communication option made it possible to deploy a network of 30 CSAT3Bs and 5 CR6 dataloggers, capable of providing fully synchronized 50 Hz measurements across the entire sensor network. 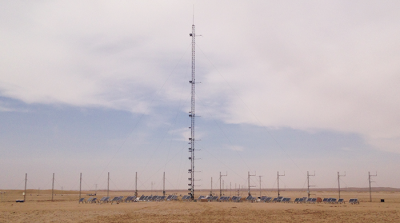 The site consists of a centrally located 30 m tower equipped with 11 CSAT3Bs that measure the vertical profiles of 3D wind and temperature, while a series of smaller 5 m towers with one or more CSAT3Bs measure the same parameters along the horizontal profile. This study aims to better understand aerodynamic processes and energy transfer leading up to and during large sandstorms, which are a frequent springtime occurrence in the desert lands of Western China. 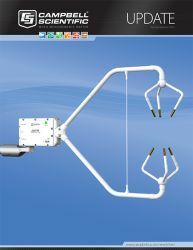 A CSAT3B sensor network in Western China (left). CSAT3Bs along a tower measure vertical profiles of 3D wind and sonic temperature (right). Another exciting product released in March was the 31022 Zero-Air Generator (ZAG). This product is a handheld source of zero air (air that has been scrubbed of CO2 and water vapor) to be used for routine zeroing of infrared gas analyzers (IRGAs). It consists of a small pump and a molecular sieve, and is powered by two AA batteries. Prior to this solution, users had to install or transport a large zero-air gas cylinder or tank to the site, or remove the IRGA from the site and bring it to a lab where zero air was available. This new product greatly increases convenience, and it encourages more frequent zeroing of IRGAs, which will improve the accuracy and quality of data from flux stations. The Zero-Air Generator may be used with Campbell Scientific’s IRGAs (EC150, EC155 [part of CPEC200 system], and IRGASON), or with other manufacturers’ IRGAs, all of which require periodic zeroing. The Zero-Air Generator being used to zero open-path gas analyzers (LI-7500 shown at left, IRGASON shown at right). Campbell Scientific continues to be highly enthused and engaged with our customers measuring fluxes. We hope these recent advances will propel forward efforts to understand the interactions between biogeochemical processes, climate change, and ecosystem science.